This summer, 20 high school girls have joined us at Workday for the Girls Who Code Summer Immersion Program. With mentoring from Workday employees, the girls are participating in more than 300 hours of instruction in web and mobile development and design, and will then break into teams to develop application prototypes addressing social issues that are meaningful to them. Given their amazing accomplishments last summer, we can’t wait to see what they create this year. Girls Who Code is a non-profit organization whose mission is to close the gender gap in technology. There are 80 Summer Immersion Programs underway across the U.S., and starting in the fall, more than 1,000 Girls Who Code after-school clubs. We recently chatted with Leah Gilliam, who serves as vice president of education, strategy & innovation at Girls Who Code. 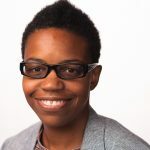 In previous roles, Gilliam led the Hive NYC Learning Network, served as director of Informal Learning at New York’s Institute of Play, and was associate professor of electronic arts at Bard College. Gilliam is also an award-winning artist and designer, having created everything from board games to interactive installations. What do you like most about your role at Girls Who Code? My background is in arts culture and production, but I’ve always worked with technology. I’ve always been interested in how systems work, and how ideas are championed. Now my lifelong interests have come together at a place where girls are discovering the beauty and elegance of computer science. As a self-taught coder, I have so much passion in making sure they feel really supported in their work. Why should companies participate in the Girls Who Code Summer Immersion Program? Our Summer Immersion Program gives girls a concrete sense of what it means to apply computer science skills in a real-world setting. It’s important they meet female engineers and see what people do all day to demystify what it’s like to be a computer science professional. That’s a problem in a formal learning space—having students understand the relevance of what they’re learning. What do the girls say they find most rewarding about the program? They talk about how rewarding it was to participate in very diverse and inclusive classrooms. They meet and create deep relationships with girls from very different backgrounds, and they learn new things about themselves. It’s really a growth experience—not just technical skills, but socioemotional skills as well. Many also say they never thought they’d be interested in computer science to the extent they became interested in it after the program. What is the “ah-ha” moment when girls catch the computer science bug? It’s when they’re able to use code and the skills they’ve learned to address an issue that’s important to them. Girls tell us one of their favorite parts of the Summer Immersion Program is the last two weeks— they collaborate on projects of their own design, addressing issues around them with other girls on their team, and come up with some great solutions and ideas. They didn’t anticipate they’d be able to make prototypes, and are very excited and inspired by what they’re able to create. Is Girls Who Code a good step to learning how to network professionally? Absolutely. Our work is much more than helping girls learn how to code—we want to build that sense of resiliency and community. As adults we may call that networking, but for the girls it’s about meeting and getting to know people from different backgrounds. They also develop a deep sense of community through mentorships with professional engineers, as well as the facilitators and teaching assistants in classrooms. Does this camaraderie help them stay with computer science? Yes. Our research team’s work reveals that girls may catch the code bug, but they often have this question about what to do next. Having that sense of community encourages them to think of computer science in the long term. To help keep girls connected, our innovation team developed and launched a mobile app called Loop. Girls use it to ask questions and encourage each other, share snippets of code, and help each other find computer science opportunities. We like to call it Girls Who Code in your pocket. What do companies get out of participating in Girls Who Code? They tell us they love having the girls around in the summer. It’s very inspiring to mentor them—and the girls ask some really hard questions! Mentors and teachers often stay in touch with participants after the program ends. They feel invested in the young women they worked with, and want to know how they’re doing. We’ve also heard about employees who demanded their companies work with Girls Who Code. To us that’s the highest compliment—when working engineers see how Girls Who Code prepares girls for what comes next. What’s the most important thing people should know about Girls Who Code? By encouraging more girls to pursue a computer science education in college, we’re helping bring more women into a thriving innovation economy. Increasingly we look to technology as the driver of innovation in our society, but the fact is we have such a huge gender gap in the field. As a result, we aren’t drawing from the full diversity of our population. We need to pull out all those great ideas and push them forward, and when that happens, everyone will benefit. Photo: High school students and a mentor participating in Girls Who Code at Workday, Summer 2016. The Workday Girls Who Code Summer Immersion Program is supported by the Workday Foundation. In this video, hear from girls who’ve participated in the program.